Huang Wei's day starts at 10:30 am. Relaxed after a good sleep, he surfs the Internet before lunch and takes his laptop to a cafe. The 26-year-old works there for three hours in the afternoon. For the rest of the day he's free to do whatever he likes. The three-hour job brings him more than 1 million yuan ($152,500) a year, while most of his fellow graduates from Jiaozuo University, Henan province, are working overtime for just a fraction of his salary. 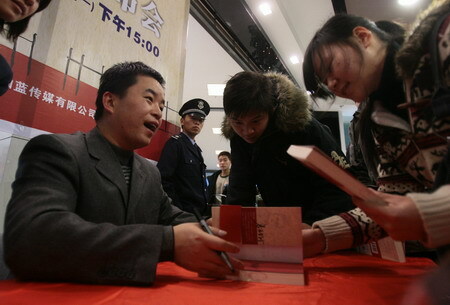 Thanks to the growing demand for Web literature in China, Huang became one of the first dozen millionaire writers to publish fiction on the Internet. China Internet Network Information Center (CINIC) said in its latest report, in January, that readers of Web literature surged to 194.8 million in 2010, a yearly rise of 19.8 percent. They account for 42.6 percent of the 457 million Internet users in China. "The Internet helped lower the threshold of publication and provided a lot more opportunities for the general public to read and write," the report said. "As Web literature began to flourish, publishing houses scoured literature websites for potential best-sellers. More and more Internet novels are being adapted to show on the big screen, and an increasing number of traditional writers have turned to the Internet to promote and publish their works. "With the expansion of authors and distribution channels, the influence of Web literature keeps growing due to a large increase in the number of users." Annual revenue of the industry has reached 5 billion yuan, which includes copyright sales of derivative products such as online games and movies adapted from the fiction, estimated Zhang Yunfan, CEO of Zongheng.com. Zhang, who runs a website that provides original fiction and cartoon installments, said the industry is likely to grow 10 times in the next five years. The history of Web literature in China can be traced to 1998 and a romance novel called The First Intimacy, but then it was more like a hobby and playground for creative and imaginative young people who thirsted for writing but had very limited channels to publish their stories. The first generation of Web writers wrote for fun and for free. Only a small number of them, including Ning Caishen, Anne Baby and Murong Xuecun, rose to fame and turned into screenwriters and best-selling authors. It took at least five years for Web literature to develop into an industry with an innovative profit model. In 2003, Qidian.com, a leading website devoted to original fiction, set a rate of 2-3 yuan (30-50 cents US) per 100,000 words for its readers. People who signed up as writers on the site could publish their stories in serial form. If their works happened to attract a large group of readers, Qidian.com editors would call the writers and ask if they would like to sell their copyrights to the website. After they signed a contract, their works would be displayed in the site's VIP section, where readers could read a certain number of chapters for free and then be charged for the rest of the novel. Later, the website would split the profit equally with the writers. This model was soon adopted by other literature websites and the charging rate remains the same today. Most readers are 20-35 years old, about 69 percent of them have a college degree and 45 percent make more than 3,000 yuan a month. The majority live in relatively prosperous cities and provinces such as Beijing, Shanghai, Guangdong and Zhejiang, said Hou Xiaoqiang, CEO of Shanda Literature. Established in July 2008, Shanda owns seven original literature websites and three publishing houses. It claims 85 percent of the readers of Web literature. Hou said that in the last quarter of 2010, more than 1.46 million registered writers published 4.1 million volumes of fictions on Shanda's websites. "We have at least 10 million users every day and 70 million unique visitors every month," Hou said.